Growing up I was involved in so many sports, I played soccer, swam, ran 10K’s and then in high school I swam and ran track. It was a life destined for triathlon. I raced my first triathlon in 1990 in Tucson, Arizona as part of my triathlon training class. It is a sport that I am not sure when I will stop doing, it has become a part of who I am. 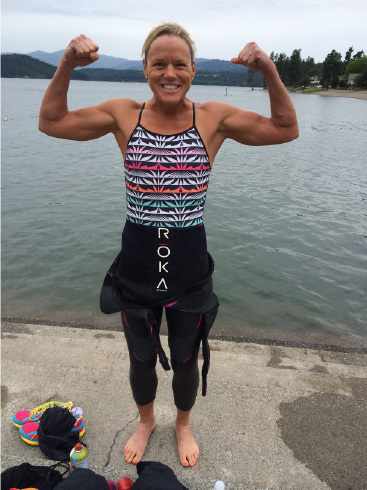 I have raced at all distances and now have focused on my favorite, the IRONMAN distance. After focusing on the the IM distance I feel that I have found my final place in the sport of triathlon. After placing 2nd at the European Championships and placing 11th at the Ironman World Championships in 2015, I’m looking forward to seeing where the next year will take me and I dream of cracking the elusive top 5 in Kona. When I’m not training, I am teaching and coaching high school students at Arcadia. I love my job and feel that my “part” time job helps me to be a better teacher and role model for my students. Erica is also a level 1 USAT certified coach, 2 time Leadville 100 MTB finisher, Vice President of TriScottsdale, 18 year high school science teacher at Arcadia High School and a multiple State Championship winner as the head swim coach at Arcadia High School. With four Kona finishes under her belt and a total of 12 Ironman finishes, Erica has established herself already as a long distance triathlete. Although her love the sport goes beyond just racing, she still strives to become the best athlete she can be. Triathletes are always looking for other challenges, beyond completing Ironman races. Erica has qualified and finish 4 Boston Marathon showing her strength on the run and showing that she can be an all around athlete and not just race (well) triathlons.